We Produced Our First Black Périgord Truffles! 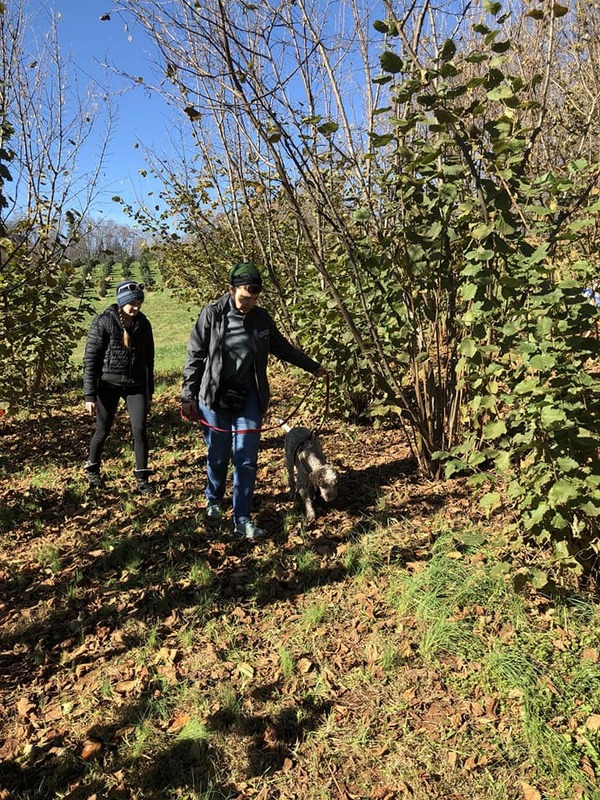 Lois Martin and her dog, Monza, and NC State University research assistant, Leonora Stefanile on the hunt for truffles. I am THRILLED to report that on November 20, 2017 we found our first Black Périgord truffles in our research orchards. This has been a very long time in coming so we are very excited. There is great interest in these truffles because they are very valuable but very difficult to grow. The first truffle that we found. Here is a bit of the back story. Many, many years ago, probably around 1993 or so, Franklin Garland of Garland Truffles in Hillsborough told me about his new truffle nursery business. He was inoculating seedling filbert trees with truffles and selling them. He also had an orchard of his own and had trained a dog to sniff out the truffles. 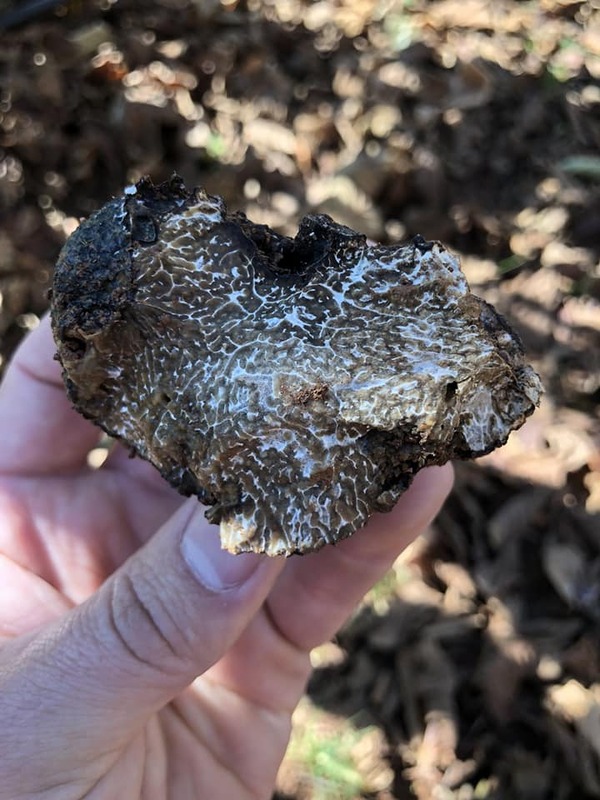 Growers across the state bought his trees and in time some of them started producing truffles. But the filbert trees were susceptible to Eastern Filbert Blight and the growers did not know how to control it. Many of these pioneer truffle growers lost their orchards. Truffle growers are a hardy stock of people and a little blight did not dampen their enthusiasm. They banded together to form the North American Truffle Growers Association which meets twice a year to discuss all things truffles. They bring in experts from around the world and over time we all gained more understanding about the biology and cultivation of truffles. In the meantime, people began experimenting with other tree species (mostly oaks) and Garland Truffles began selling filbert trees with resistance to the Eastern Filbert Blight. But we still couldn’t reliably produce truffles. We needed research, but I had not been successful in finding funding to support it. Planting our first filberts inoculated with truffles. 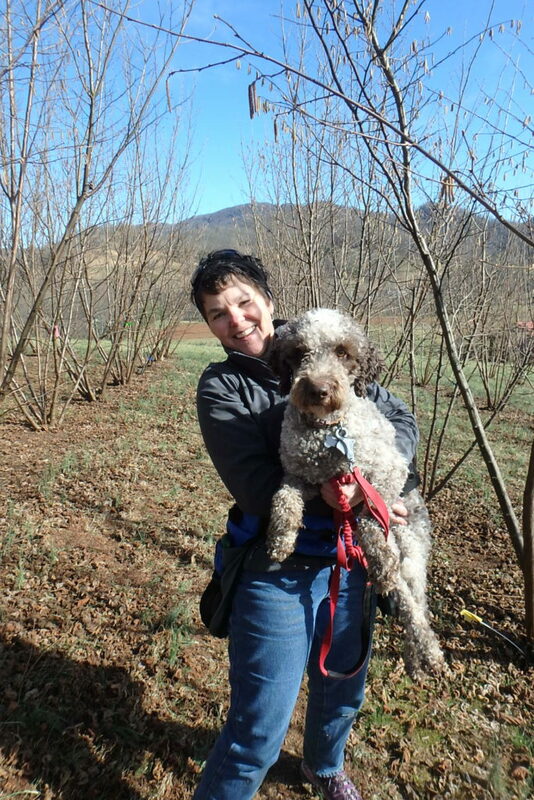 In 2009, Franklin and Betty Garland donated 80 trees to my program to start a research truffle orchard with the hopes that in time I would find funding to support it. The Mountain Research Station agree to let us plant our orchard there. 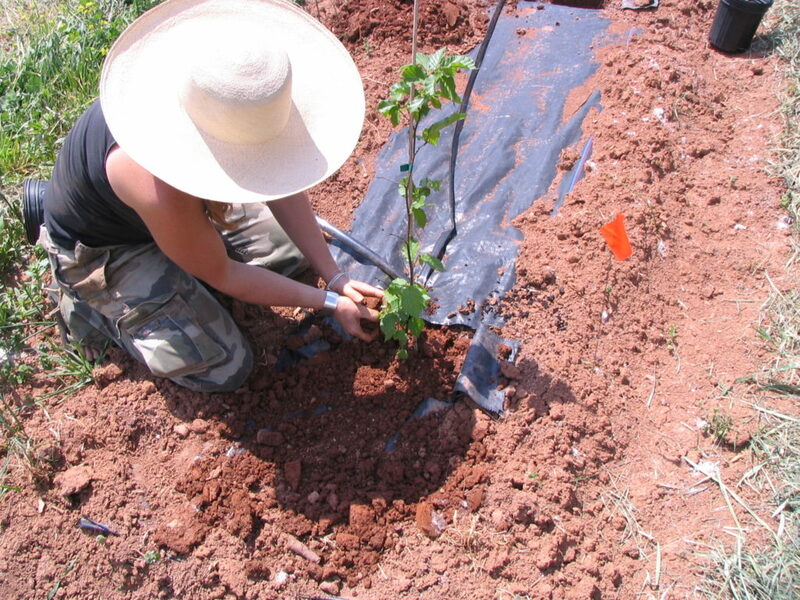 That year was extremely wet and we were concerned about whether the trees would survive under those conditions, so we held the trees in pots and spent the year preparing the orchard site. In spring of 2010 we planted our first orchard. 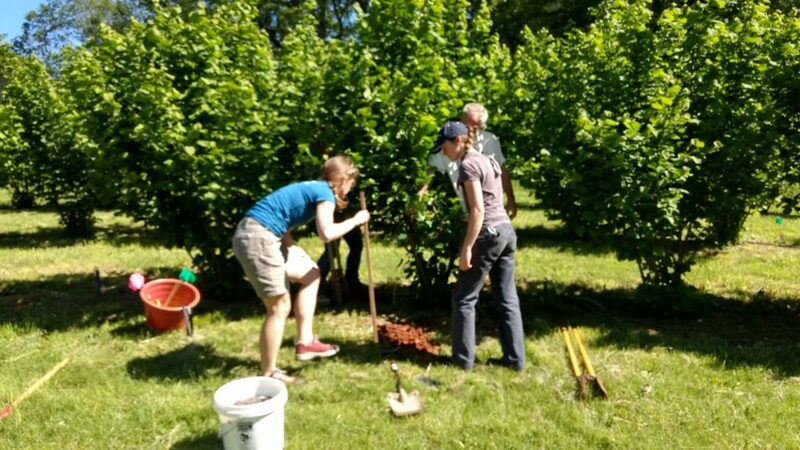 In 2013, the Garlands donated another group of trees which were supposed to be much more resistant to Eastern Filbert Blight, and we planted our second orchard. In their natural environment in Southern Europe, Black Périgord truffles thrive in a calcium rich soil with a very high soil pH. That is not what we have naturally in western North Carolina! So we limed our orchards heavily every year. We also installed a drip-irrigation system and provided the young trees with good moisture throughout the growing season. We kept the grass mowed and the weeds controlled. 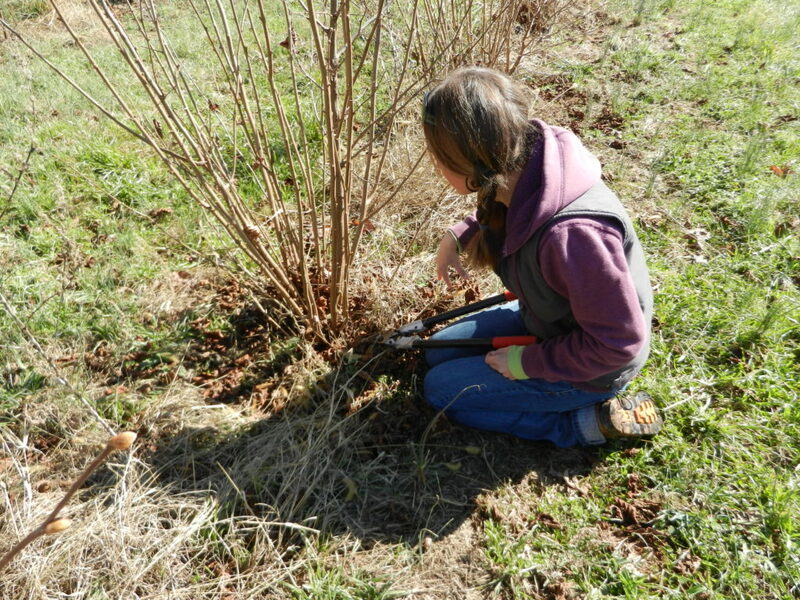 We pruned the trees into a shrub shape every winter and carefully scouted the orchards throughout the year for any signs of Eastern Filbert Blight. We did find a few lesions (confirmed by the NC State University Plant Disease and Insect Clinic) and pruned them out and applied fungicides to the trees. The “we” I keep referring to here includes my staff and the staff of the Mountain Research Station. 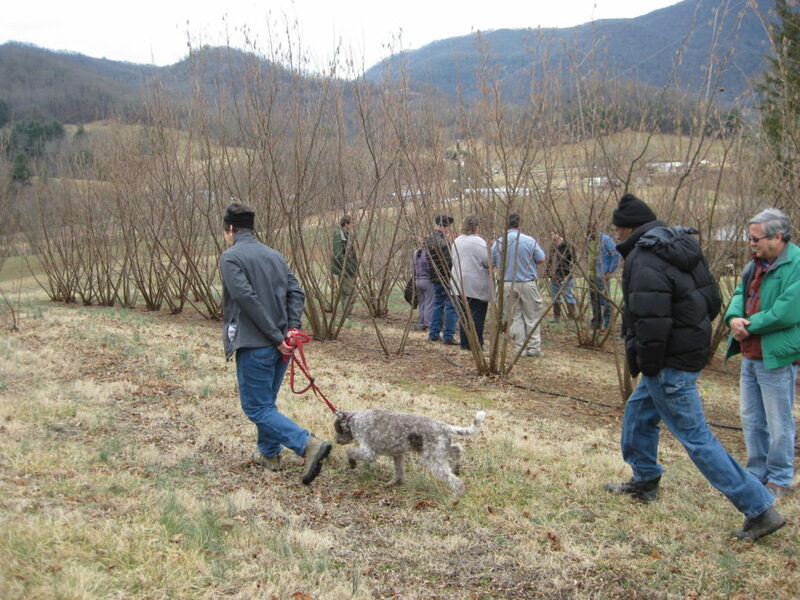 The North American Truffle Growers Association visiting our orchard. Our research orchards have been visited by hundreds of people over the years, including wanna-be growers, current growers, extension personnel, pathologists, agronomists, consultants, investors, home gardeners, and many more who are interested in this highly valued, but difficult to grow fungus. We have had visitors from Spain, France, Australia, New Zealand, China, and more. Applying treatments to the truffle orchard. Finally we got a grant to work on truffles. It was awarded to us through the Specialty Crop Block Grant Program administered by the NC Department of Agriculture and Consumer Services. That grant was to evaluate and develop methods for monitoring truffle colonization in truffle orchards. It also allowed us to do some other studies in our orchards. We added treatments including looking at wood ash to raise the soil pH, removing trees to let in more light, and reinoculating some trees. The latter was done in cooperation with Carolina Truffières. We were very fortunate that as we initiated the grant project, plant pathologist, Inga Meadows, started her new position with NC State at the Mountain Horticultural Crops Research and Extension Center. She already had some experience working with truffles in New Zealand and so led the DNA analysis and microscopic examination aspects of our project. One of the great outcomes of that project is that Inga now offers a testing service to identify and quantify the presence of truffles in growers’ orchards. Here is the link to her website. Lois Martin and her truffle dog. Two other great partners on our project are Lois Martin and her dog, Monza, of the Truffle Dog Company. They have worked with us for several years to scout our orchards for truffles, for the only way to find them is to sniff them out! 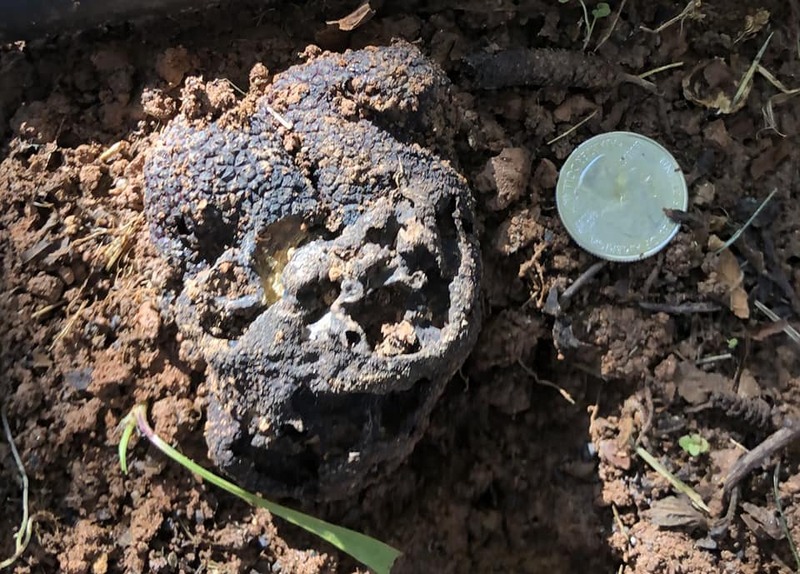 These were the first truffles they have found in a North Carolina orchard. The interior of our first truffle. So, we all are pretty excited! It took seven plus years of patience, hard work, and dedication. But we did it. We grew Black Périgord truffles! So, what did we do with our first two truffles? Well, after carefully photographing, weighing, and measuring them, we divided them up among all the people we could find who have worked on the project and we are going to EAT THEM!! !